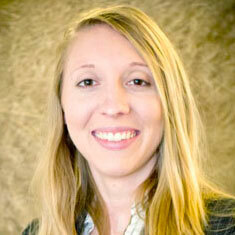 Jennifer Schmidt, research assistant professor at UNL's Midwest Roadside Safety Facility. With the knowledge that more than 30,000 people die in crashes on America’s highways every year, Jennifer Schmidt, research assistant professor at UNL’s Midwest Roadside Safety Facility, has made it a priority to find ways to make travel safer. Work that led to Schmidt receiving a doctorate in civil engineering from UNL in 2012 has continued to gain attention from transportation safety experts around the country. In January, lead engineer Schmidt and her team – Robert Bielenberg, John Reid, Scott Rosenbaugh, Ronald Faller and Tyler Schmidt – received the 2015 Best Paper Award from the Roadside Safety Design (AFB20) Committee at the 2016 Transportation Research Board’s annual meeting in Washington. It was the second time in three years that Schmidt’s work has earned the award. “The whole idea is to make highway travel safer for the smaller cars and pickup trucks that might impact a roadside barrier,” Schmidt said. Schmidt’s group, working with grants from the Federal Highway Administration and Nebraska Department of Roads, is developing a barrier that can reduce the probability of severe injuries and deaths in collisions. The barrier absorbs the energy created when it is struck by an 11-ton truck at typical highway speeds and then redirects the vehicle safely as the barrier snaps back to its original position. This barrier, Schmidt said, is an extension of the work the MwRSF did more than a decade ago to develop SAFER barriers – a system of thick, foam cartridges that are now employed at auto racing facilities around the world. Schmidt said her group wanted to find ways to make more durable energy-absorbing barriers that would not only save lives but also be more cost-effective to maintain. “We actually got this through a federal earmark to take that SAFER system and try to design a system for highways that uses a similar (energy-absorbing) mechanism,” Schmidt said. “We just can’t take the SAFER barriers and install them on highways because it’s not as durable as the current barriers. Every time there is an impact, you’d need to replace the foam cartridges and know where it was impacted. The buzz created by the team’s paper and Schmidt’s presentation created a lot of interest from many states, Schmidt said. Schmidt said, once the FHwA gives its approval, the barriers could be installed by any state department of transportation wherever it is needed. There is still more testing to be done before that approval can come, and with help from NUtech Ventures, Schmidt’s team is submitting applications to patent some components developed during the project. But, Schmidt said, a greater legacy of the project might not be measurable.